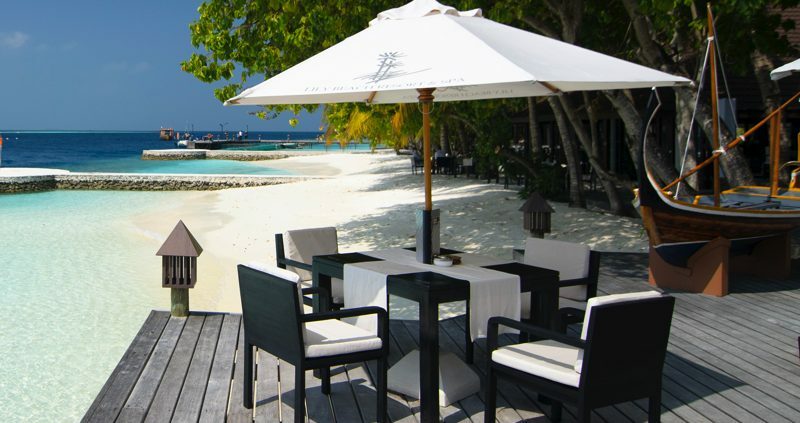 Lily Beach Resort book your 5* luxury Maldives holiday today. Lily Beach Resort and Spa enjoys a well deserved reputation for its pristine beaches, its lush tropical vegetation and the fantastic house-reef. The favourable location in the spectacular Ari Atoll is close to some of the most amazing dive sites and it has one of the best house reefs in the Maldives. Lily Beach Resort and Spa has beautiful natural surroundings and fabulous resort facilities and is a perfect place for a relaxing holiday, a fun family break or a romantic honeymoon. 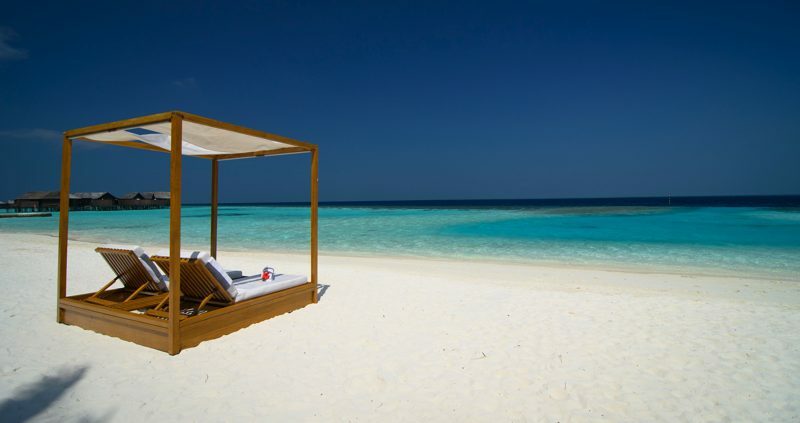 The Resort was reopened in 2009 as a 5 star Luxury resort, the first 5 star All Inclusive Resort in the Maldives. The villas at Lily Beach Resort and Spa are a wonderful combination of wood, different kinds of natural stones and modern design, which blend ingeniously with the natural surroundings of the island. 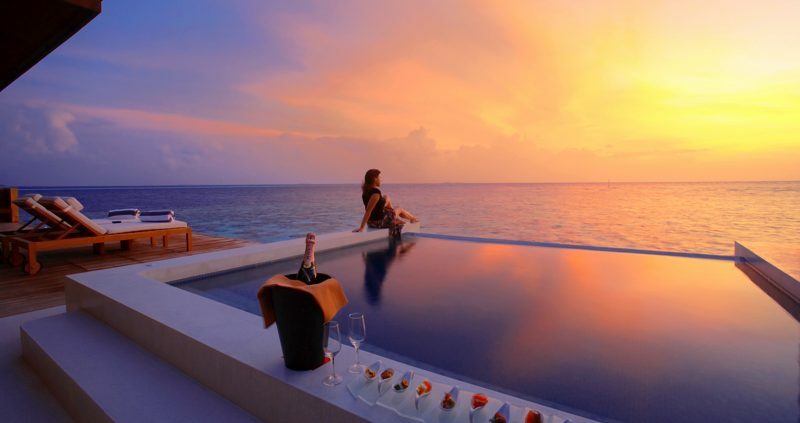 You can choose Beach Villas, Lagoon Villas, Family Beach Villas, Deluxe Water Villas Sunset Water Suites, You will really enjoy the luxury and hospitality of the island whichever you choose. Lily Beach Resort and spa has 4 restaurants and 3 bars. Whatever your favourite meal, Lily Maa, the main restaurant offers a culinary delight. 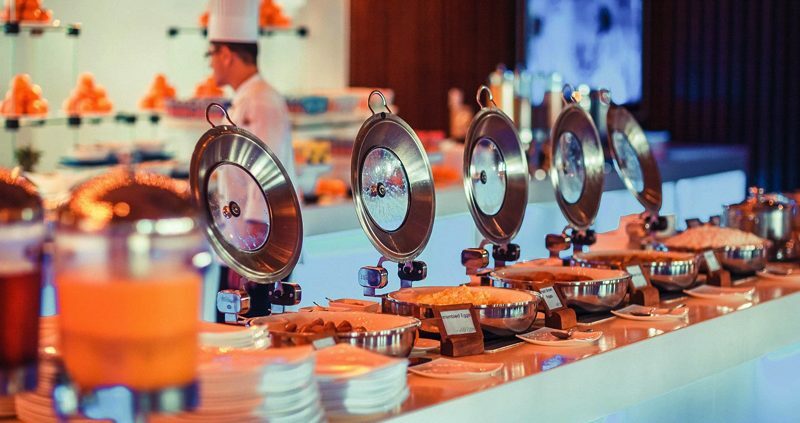 The restaurant is renowned for its sumptuous buffet and themed dinners. The other 3 restaurants are a la Carte, there is the Teppanyaki an Asian, offering Oriental and Indian dishes and a fine dining restaurant. The AQVA Bar is a favourite chill-out spot for many guests. The Vibes bar is the lively poolside bar and is the islands main entertainment venue. Spirit Bar is a perfect place to unwind and relax after an eventful day, or to stop for a drink during the day. At Lily Beach Resort and Spa there is plenty to keep you busy if you tire of relaxing on the superb beach. 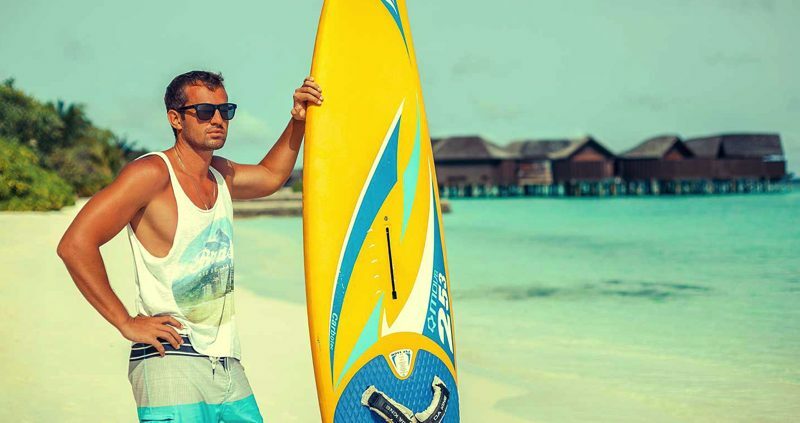 From the gym, to a Water Sports Centre, activities include canoeing, windsurfing, wake boarding, sailing and banana-boat rides. If you still want more there is a tennis court, table tennis, darts, billiards/pool and beach volleyball. You can take trips to go island hopping, big game fishing, or on a snorkeling safari. For the younger guests there is a Kids Club and two swimming pools. Evening entertainment at Lily Beach Resort & Spa includes live music, variety show, group games, disco, night fishing, and various beach games. 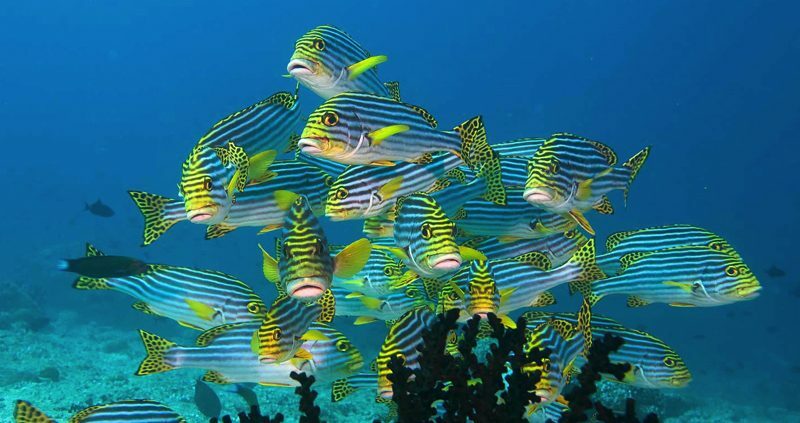 The lagoon and house reef are amazing for snorkeling, where you can see baby black tip sharks, eagle rays, stingrays and all kinds of reef fish. With an incredible 50 dive sites around the island in South Ari Atoll, the accredited dive team has extensive knowledge of the best diving in the area. Whatever level you are at, there is a superb diving experience waiting for you here. The Turtle Kids’ Club offers a wide variety of activities, allowing your kids to have fun. For children from 3 to 12 years, they can take part in crab races, crafts, watersport activities to treasure hunts, your little ones will be in good hands. The indoor area is air conditioned and equipped with oversized day beds, a small library, a variety of games, toys and kids movies. 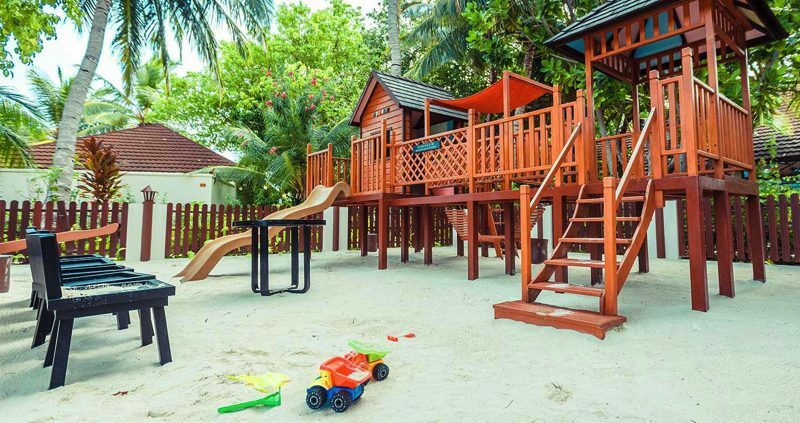 The outdoor playground offers a tree house with a slide, swings and a basketball court.